Think back to the last time you walked a massive trade show. You probably don’t remember the blur of booths sprawled across miles of crowded isles; however, you most likely walked away with visions of a few spectacular standouts. If so, what set these one-of-a-kind winners apart from the others? Were they created from a perfect plan or did their magic happen by chance? The K2 team took this strategically creative approach to produce a client’s award-winning, cool-vibe standout at this year’s Consumer Electronics Show (CES) in Las Vegas, Nevada. K2, in collaboration Santa Monica-based Doria, International Inc., created a captivating exhibit that was named on Exhibitor’s Magazine’s 2019 CES most remarkable exhibits list. There were 4,400 individual exhibits featured at the 2019 show; 20 of them, including Doria, were selected as being the most impressive. In fact, this is actually Doria’s second win. Doria also made the 2018 CES top 20 list after K2 fabricated a style-centric, loft-inspired booth for the company. 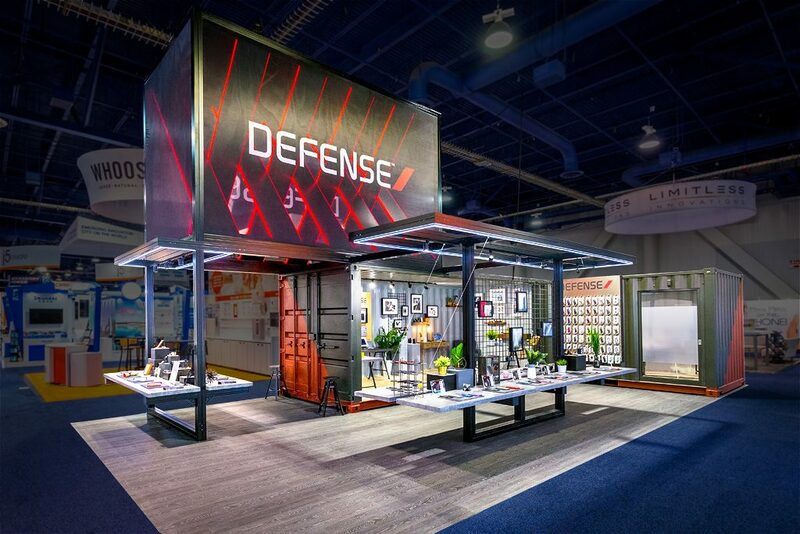 Doria’s 2019 award-winning, 20 ft. x 40 ft. exhibit was based on the company’s stylish, drama-like vision to use repurposed shipping containers in an L-shape configuration. Inviting kiosks and sturdy visual elements were incorporated into the design to effectively showcase products and captivate customers. The robust, black-and-red overhanging sign was internally lit to powerfully present their brand. The show space, including the shipping container interiors, offered a uniquely masculine, yet soothing respite for customers to browse, relax, and talk product and sales.